Hillary Clinton’s denunciation of the Alt Right brought up many questions among her supporters, such as “What is the alt right?” In fact, it’s not a numerically significant part of the US population nor is it a faction of the Republican Party, like the Tea Party, or Neo-Cons are (or maybe were). So it’s curious that Clinton would try to frame her real purpose this way, since the real purpose of the speech was to denounce Trump and his supporters as racist. In fact, the Democratic candidate calling the Republican candidate and his supporters racists is probably the most normal thing that’s happened in this campaign so far. I’m sure a lot of pundits breathed a sigh of relief that at least this was a normal and predictable thing in political campaigns. But the idea of using the term alt right into a major speech and make it the major focus seems odd since virtually no one outside of political junkies would even know what that term means. My guess is just like her opponent; Hillary has a bit of the conspiracy theorist in her. Remember the vast right wing conspiracy? So trying to pin a small but very internet active group as the real brains behind the Trump campaign may appeal to her sense of sinister unseen forces plotting against the Clinton machine. I could write multiple posts on the Alt Right but for the uninitiated, Breitbart published a pretty good summary a few months ago here and due to recent interest, there have been several others that have popped up, including this one. The gist, and why it defies easy summary, is because it’s not one group but multiple groups with differing interests, goals, and agendas. Basically it’s all kinds of right leaning groups that are outside mainstream conservatism and because of that, with no party to call home or realistic political agenda, they’re not really politically active, although they are certainly internet active. 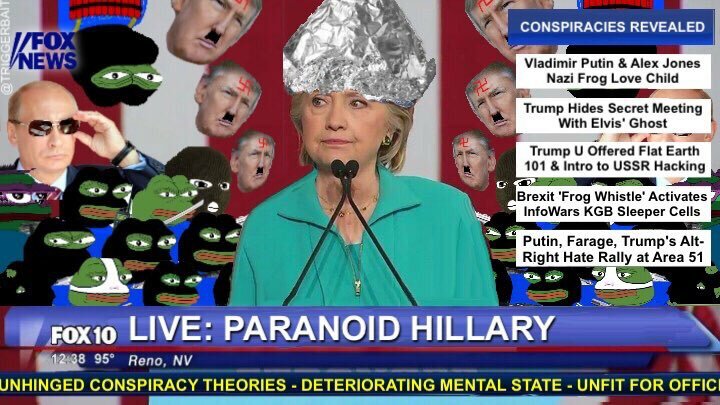 So Hillary, in her tinfoil hat wearing way, is totally wrong that they are pulling the strings on puppet Trump. And she’s wrong that they nothing but relabeled KKK or Nazi’s. I think that’s probably a pretty good working definition of anti-Semitism as any I’ve come across. And I would agree that in the United States, Jews are a highly assimilated white ethnic group; too assimilated for some Jewish leaders when you consider the non Orthodox Jewish intermarriage rate is an astounding 71%. And for that and many other reasons, I find anti-Semitism one of the most difficult bigotries to understand. When I first started commenting and posting about politics on internet forums, I noticed the preponderance of anti-Semitism came from the left. Jews have come a long way from Holocaust victims to Palestinian oppressors, but that is basically how the left views Jews; through the lens of Israel. The left, and particularly the American left, loves an underdog and in the post World War II era, that described the Jews to a tee. But the very success of Israel moved Jews from the underdog/victim category to oppressor category (for the left, there is no in-between). Suddenly, the Palestinians became the victims, and their decades long terrorist war against the Israel supporting nations in general and Israel in particular suddenly became the war of a freedom fighter. Leftist Jews in the US usually continued to be leftist with the exception of the Israel question. For non Jews, more and more part and parcel of leftist ideology was the goal of eliminating Israel as a Jewish state, either through integration of the Palestinian territories into Israel proper and letting democracy finish the job, or…some other way. But leftist anti-Semitism was really the only type of anti-Semitism that I’ve had any knowledge of. I knew historically, there was an anti-Semitic Right; Jews were kept out of WASP country clubs and so forth, but I was blind to a contemporary one. A lot of that has to do with my own upbringing. Raised in the evangelical South, Jews were God’s chosen people. With very few actual Jews in the South but lots of Bibles, the idea of what a Jew is came from the Bible and evangelical interpretations of it. So if you’re an evangelical Christian, you have a duty to love God’s chosen people. Polling bears that out. A poll of how various religious groups rate each other reveals that Jews are rated more positively by white evangelical Christians than any other group (excluding Jews themselves of course). You won’t be surprised to learn that the feeling isn’t mutual. The same poll shows that Jews rate white evangelical Christians the lowest of all polled religious groups, slightly below Muslims who are trying to kill them on a daily basis. For the evangelical Christian, that’s OK since Christian love doesn’t require reciprocation. But the sweet irony of that does mean that evangelical Christians, who became a potent political force in the Republican Party during the 1980’s under Ronald Reagan, helped finish the job that William F. Buckley started in the early 1960’s, by not only clearing the Republican Party of any trace of anti-Semitism, but go a few steps further and install a pro Israel right or wrong plank as key to Republican foreign policy. But the alt Right is a different animal from the typical church going Republican. There are alt Right factions that are pretty openly hostile to Jews. Their anti-Semitism is more an old fashioned version in which Jews are part of some conspiracy to destroy Christianity/Western Civilization/White People/Fill-In-The-Blank. Those anti Semitic factions view immigration as part of some Jewish plot to destroy the country. It’s so absurd that it’s hard to understand how anyone could take seriously the idea that Jews, as Jews, have some big goal to open the borders to “get” the non Jews. Many Jews support open borders because they’re liberal, not because they’re Jews. It doesn’t even pass the logic test. Why would Jews want to fill up a country they live in with anti-Semitic middle easterners? Think how difficult Jewish life has gotten in places like France. Who would plan to import millions of people who want to kill you into their country? Now Jews are fleeing France because of the view the terrorist threat there has made the entire country unsafe for them. Numerically, I don’t think Anti-Semitism is any great threat (at least in the United States) to Jews, although it’s interesting to note that according the FBI, the largest group of religious bias crimes are against…you guessed it, the Jews; with 56.8% of religious bias crimes against Jews. Jews punching above their weight again! But Anti-Semitism is real thing, and where it exists on the Right, it is along the ridges and contours of the Alt Right. This entry was posted in Politica, Race and tagged Alt Right, Alternative Right, Anti-Semitism, Breitbart, Donald Trump, Election 2016, Evangelical Christians, Hillary Clinton, Politics, race, Vast Right Wing Conspiracy. Bookmark the permalink. Most of them have demonstrated very little value as an ally to the alt-right. Jews are just pacifists, the kind of guys who just sit back and enjoy the show, while others are doing the dirty work. If only Jews are like the Inquisitors of Spain, who terrorized their own people for not being Catholic. If only Jews were the like Hilter’s Jewish officers, who ensured the Nazi party and its ideals would survive. So in other words, Right leaning Jews are basically doing the exact same thing as Right leaning non Jews? They are worse than liberal Jews, because alt-right Jews don’t do anything proactively to demonstrate their right leaning ways. This is the reason why the alt-right has been suggesting that right wing Jews to leave for Israel, because Israel is a right wing country, and Israelis are required to defend the nation’s idealogies, ie…such as joining the military. You incorrectly assume that there has to be a conscious Jewish effort to destroy the West so that the theory can hold any water. Germans can’t help it that they’re efficient. The French can’t help it that they’re romantic. The Jews can’t help themselves from developing radical ideas that are diametrically opposed to current societal norms (think golden calf and Marxism). I’m not sure how there could be a subculture specifically to come up with really bad ideas. The Jews are radical, because they fear Whites and also depend on them. They cannot survive in non-White countries, and yet they also fear Whites for a number of reasons, hence multiculturalism serves as a wall or barrier to prevent Whites from targeting them directly.